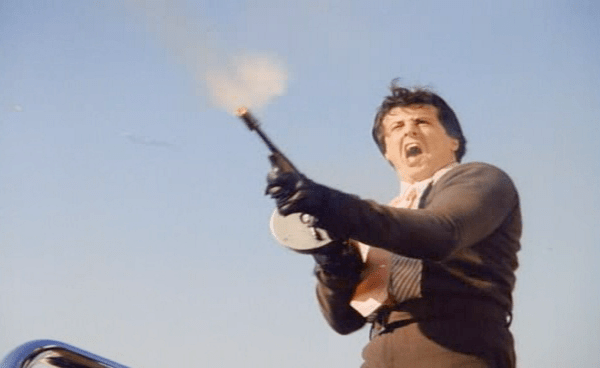 DEATH RACE 2000: The Darkly Witty Flipside Of Dystopian Sci-Fi – Schlockmania! 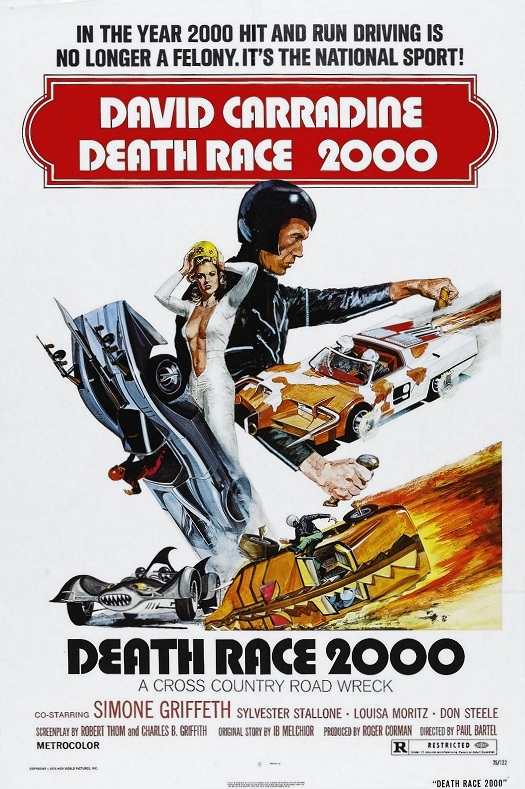 Whenever someone asks Your Humble Reviewer what his favorite science fiction film is, the answer is simple: Death Race 2000. This response sometimes gets raised eyebrows because it is thought of as an action movie or an exploitation flick. However, a movie doesn’t have to have aliens or spaceships to be good science fiction. All that’s required is an imaginative view of the future, preferably shaded with some sort of interesting social commentary. Death Race 2000 delivers all of the above with smarts, style and a very distinctive personality. The premise mixes surefire drive-in movie content with deliciously subversive satire. It is set in a potential future where the United States is ruled by a sinister government that uses religion and media to keep the public under its thumb. Their most effective tool is the Transcontinental Road Race, a mixture of racing and vehicular murder in which racers mow down as many victims as possible as they race from New York to Los Angeles. Competitors include the sultry Calamity Jane (Mary Woronov) and hot-tempered sociopath Machine Gun Joe Viterbo (Sylvester Stallone) but the race’s reigning champ is Frankenstein (David Carradine), an endlessly injured-and-rebuilt tough guy who hides his scars under a black leather jumpsuit and mask. He’s the odds-on favorite but he doesn’t know he has another foe hiding in plain sight – his lovely navigator, Annie (Simone Griffeth), is a double agent and a member of an anti-government resistance group that plans to sabotage the race. Thus, the stage is set for crashes, corpses and explosions galore, all delivered with a sly, barbed sense of wit. At just under 80 minutes, Death Race 2000 crackles with energy as it tears through its surprisingly involved storyline at whiplash speed. The mayhem is crisply lensed by Tak Fujimoto, who would go on to shoot countless Jonathan Demme classics (there’s also some great 2nd unit camerawork by Eric Saarinen, who would soon shoot The Hills Have Eyes). Tina Hirsch’s editing also plays a role in creating the film’s adrenalized feel, giving it the punchiest jump-cut style this side of a Russ Meyer flick. Also worthy of note is an eclectic score by Paul Chihara, who mixes jazz, symphonic, funk, prog and electronica elements to create a constantly-shifting musical background with a delightful retro-futurist feel. However, Death Race 2000 has more on its mind than just cheap thrills. The script was penned by Robert Thom (the genius behind Wild In The Streets) and veteran Corman collaborator Charles B. Griffith. They offset the frequent bursts of action with clever dialogue that combines the speed and rhythm of screwball comedy with acidic, post-modern sense of humor and a clever, multi-layered plot packed with surprises that dovetail nicely with the carnage. It’s also ahead of its time in satirizing the parasitic relationships between the government, media and big business. The end result plays like a refreshing and mordantly funny flipside to the grim dystopian dramas that dominated pre-Star Wars era of 1970’s sci-fi. Better yet, Paul Bartel’s smart direction highlights the subversive humor in the film, foreshadowing the skill for chic comedy he’d later develop in films like Eating Raoul and Scenes From The Class Struggle In Beverly Hills. He’s also got a great eye for pop-art imagery (large, empty rooms with a futuristic design are used to dazzling effect). However, the most unique and interesting thing he does with the story is draw out some unusual moments you would never expect a film like this to have. Your Humble Reviewer’s favorite scenes in this category include a moment where Frankenstein shares a dance with his navigator in their room while wearing only his mask and underwear as well as an oddly moving scene where Frankenstein has a philosophical exchange about the race with a representative from his fan club. Finally, the performances in Death Race 2000 are pure gold. Carradine underplays his role with a dry wit, making his antihero character appropriately tough and stoic but possessed of a convincing, steely intelligence. Stallone steals every scene he’s in as Viterbo, playing the heavy with relish and showing a nice sense of comic timing that he’s rarely used since. However, the most underrated performance comes from Griffeth as the turncoat navigator: like Carradine, she carries herself with grace and a subtle humor that allows her to hold her own in her frequent scenes with Carradine. It’s a shame she didn’t have a bigger career because she definitely had the chops for it. Their work of the aforementioned leads nicely supported by a who’s who of Hollywood exploitation flick vets. Woronov and women-in-prison flick regular Roberta Collins (as Matilda The Hun) create perfect tough-chick archetypes and Karate Kid fans will be amused to see the future leader of the Cobra Kai Martin Kove camping it up as an effeminate racer. 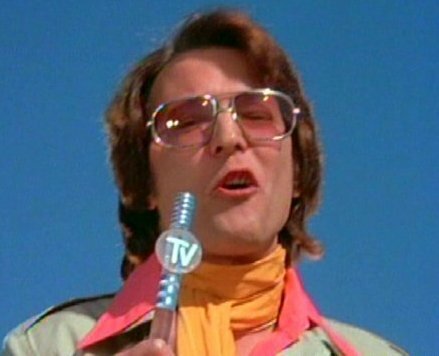 Another standout is “The Real” Don Steele, a real-life disc jockey who invests his race commentator character with an bombastic, rat-a-tat-tat style of humor that makes him a vital part of the film’s darkly witty appeal. 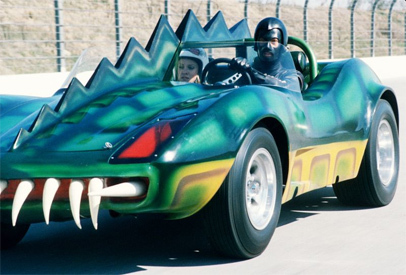 In short, Death Race 2000 is not only a peak-level example of the savvy drive-in fare Roger Corman produced at New World Pictures but also a rebellious, intelligent peak of 1970’s science fiction. It remains every bit as exciting and trenchantly funny today as it was in 1975 and is a must for any self-respecting schlock aficionado. Schlock-Wire: Specs For Shout Select’s Special Edition Blu-Rays Of NIGHTHAWKS And TO LIVE AND DIE IN L.A.